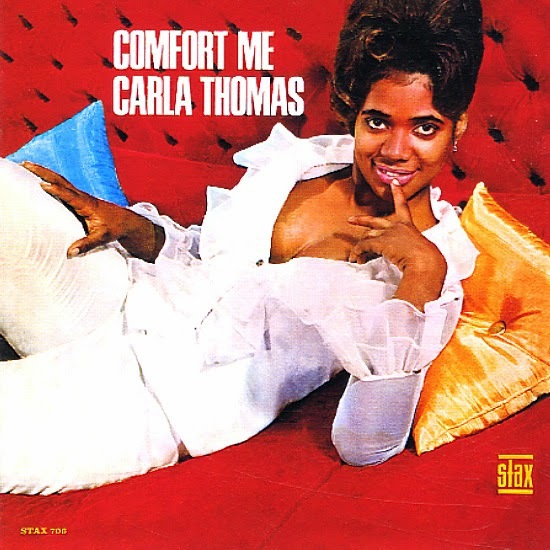 Carla Thomas had been Stax Record's first home-grown star, her 1960 single "Gee Whiz" helping get the Memphis-based record label off the ground. Over the next few years Stax developed its own unique sound and identity, recording more hits with The Mar-Keys, Otis Redding and Booker T & The MGs. Carla Thomas released many singles over this four year period, none of which were big hits like "Gee Whiz", but many of which charted well. 1962's "I'll Bring It Home To You" got to #9 R&B and 1963's "What A Fool I've Been" got to #28 R&B. Up until 1965 all her singles were released on the Atlantic label, which was responsible for Stax's distribution in the early days. In early 1966 her second solo album was released. The sound of Comfort Me was very different to that of her debut over five years earlier, as she was now backed by The MGs and The Memphis Horns, giving her music the lean, sparse R&B sound Stax was by now known for. Three of the songs on the album had seen release as singles, the brilliant title track in 1965 (which didn't chart), and both "No Time To Lose" and "A Woman's Love" in 1964 (which was the year the R&B chart had been temporarily discontinued, so they only appeared on the national pop chart at #67 and #71 respectively). All three songs were written by the MGs guitarist Steve Cropper (he co-wrote "A Woman's Love" with Carla herself). The rest of the songs were freshly recorded for the album, and featured covers of a few well-known pop songs done the Stax way - "What The World Needs Now", "Let It Be Me" and "Will You Love Me Tomorrow".